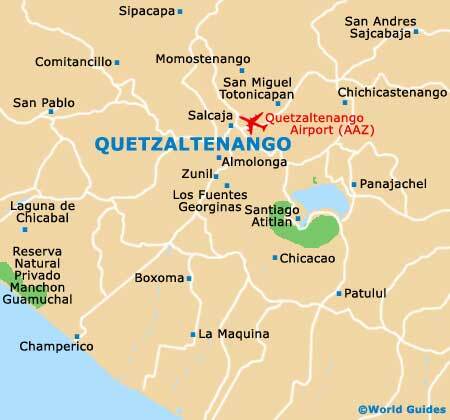 As with many remote destinations, the main landmarks in Quetzaltenango are the region's natural wonders, such as the neighbouring volcanoes, the remnants of massive eruptions, the crater lakes, the national parks and other areas of simply spectacular beauty. Quetzaltenango has lots of wonderful treasures in its Mayan villages, whose culture and traditional lifestyles continue to this day. Their heritage is a memorial to a civilisation who occupied the region for hundreds of years, long before the Spanish arrived in the 16th century. In the city of Quetzaltenango, manmade landmarks come in the form of the Templo de Minerva (Temple of Minerva) and the Catedral del Espiritu Sagrado (Cathedral of the Sacred Spirit), two churches made into one with an exquisite 16th-century frontage. This massive stone neo-classical representation of a Greek temple to the Goddess of Wisdom was begun in 1914 at the request of Guatemalan president Manuel Jose Estrada Cabrera, but was actually only completed in 1973. Its present use is as a venue for open-air cultural events. During the rainy season, shelter is provided by its pointed roof and the giant columns around its sides allow for the free flow of the breeze. Sited on the eastern side of the Parque Centro America and without doubt one of Xela's most interesting buildings, the Cathedral of the Sacred Spirit boasts an elaborately carved frontage, which was once part of the original 16th-century church. The remainder of the structure was built in neo-classical style at the very end of the 19th century. Several domes complete this highly original architectural composition, while outside, the plaza regularly plays host to a bustling market. Just behind is the considerably more modern Metropolitan Cathedral (Catedral Metropolitana), which dates from the 1990s. Declared a Guatemalan national park in 1955 and covering just under 2.5 square kilometers / 1 square mile, this lush green hill is set on the south-eastern border of the city, overlooking the valley. The best views of the cityscape are from the summit of Cerro El Baul and this is an easy hike. Sadly, its environment is threatened by urbanisation across its borders and illegal deforestation. Due to the volcanic nature of the region, the city of Quetzaltenango and its surroundings are blessed with naturally occurring medicinal hot springs. There are many hot spring baths, wells and spas in the city, all offering different ways to benefit from the minerals and salts in the waters. The best time to try one might well be after a strenuous hike or day of sightseeing. A high proportion of residents in this city are of indigenous Mayan stock. The various Mayan languages can be heard all over town and traditional costumes are still often worn by the locals. Landmarks of the ancient Mayan culture are rare in cities, but in the many Mayan towns and villages in the hills above the city, visitors will get a glimpse of a fast-vanishing way of life. Zunil and Almolonga make for two of the best excursions. When first seen, this charming old stone bridge resembling a Venetian canal bridge appears to have been built for no good reason, over a road with homes either side. In fact, it was constructed in 1883 to take traffic when the road became flooded, as it often did. In the last century, the course of the river changed and the road no longer floods, but the quaint Bridge of Los Chocoyos still stands and makes for a great photo opportunity.